If we only paid attention to music made by Steve Roach and Erik Wøllo we would still have a lot to choose from. Between the two of them they have released dozens upon dozens of amazing space, ambient and contemporary instrumental albums. Each made their mark both as innovator and visionary and their surprising endurance in a world not ready for space-time players has thankfully lead them together into two musical collaborations thus far. 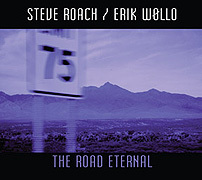 The Road Eternal (63'28") is their second CD as a duo - and feels much different than their first, Stream of Thought (2009). The six tracks are longer time-wise, as these beautiful realizations stretch out along a contour of hidden designs. The pieces develop fast, with reverberant synthesizer chords giving way to synchronized grooves. With the introduction of mechanized patterns and the resulting restless energy, space and time are seemingly transformed. Extending above the building electric tension are rich melodic lines - whose slow pacing leaves plenty of air for churning e-riffs and commanding basslines to motor onward. The Road Eternal, with its breathing thought tones, ethereal leads and unhindered pulsations, produces such aural and emotional wonders - along with the profound images this music awakens in us.